Physical details on enlistment Age 18, 5’9”, 10 stone 9 pounds, blue eyes and dark brown hair. Alan was wounded at the battle of Fromelles on 19/7/1916 and died of wounds on 21/7/1916. He was born and breed in Leongatha and attended Leongatha State School and High School. 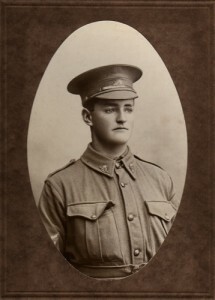 15/7/15 He enlisted in Leongatha. His parents gave him their permission to enlist as he was 18. He had been in the cadets and was still serving with them. 24/11/15 He disembarked in Egypt. 23/4/16 Mrs. Russell wrote asking for details of his postal address. Emma Russell wrote asking for more information about his death as to when and where he died. She also asked where he was buried on 8/8/16 The answer pointed out that they knew no more and that he probably died the day he was wounded.